Last week, I posted about grilling Romaine lettuce and a bunch of you asked for recipes for making your own salad dressing. Tada!!! Actually, I was already working on this post with my friend Katie Morford, a registered dietitian and author of the blog Mom’s Kitchen Handbook. She publishes wholesome, family friendly recipes and tackles some of the issues and challenges around raising kids with healthy attitudes about food. Noticing that this dressing calls for non-fat yogurt and light sour cream, I wanted to find out her philosophy about using reduced fat products in her cooking. Snack Girl: When is using a low fat product a healthy choice? Katie: My first priority is always taste. That is a big driver in whether or not I'll buy a lower fat or lower calorie food. For example, I don't eat fat free ice cream because it just doesn't taste good to me. I'd rather have a super satisfying, full fat cone once a month than a fat-free cone every week. I also look at the ingredients. Fat and sugar add flavor and texture so when you cut those out, food manufacturers sometimes compensate by adding junkie ingredients. It's not worth it to me to buy a fat-free butter spread that is full of artificial ingredients. I'd rather just keep it to a small portion of the real stuff. In this recipe, I use reduced fat dairy products instead of heavy cream or full-fat sour cream. I leave it up to the cook to decide what type of mayonnaise they want to use since it's only two tablespoons and I don't want folks feeling like they have to run out and buy a special kind of mayo to make it. Using the lower fat products in this recipe still yields an excellent, creamy dressing but with less saturated fat and calories than a typical homemade ranch. It's also a whole lot healthier than most bottled versions which often have artificial flavors and MSG. This ranch dressing is lip smackingly delicious, but lower in fat and calories, and purer in ingredients, than bottled brands (although Hidden Valley now makes an organic version that doesn't have the MSG or artificial flavors of the original). Instead of buttermilk for the dressing's signature tang, it calls for plain yogurt since that’s a more common household staple. Light sour cream and a touch of mayonnaise round out the richness. Chives and garlic give it zing. The whole thing gets whirled all at once in the food processor. The dressing is a little on the thick side. 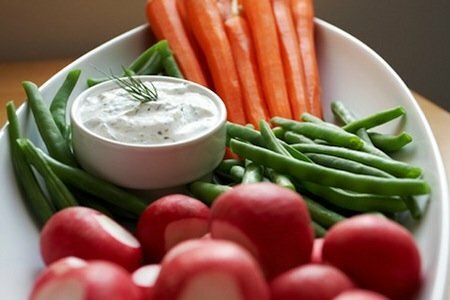 For a vegetable dip, keep it as is. If using it to dress a salad, whisk in a little milk until it thins to your desired consistency. You can play around with the amount of garlic, cutting it to half of a clove to start if you are sensitive to the taste. Put the yogurt, sour cream, mayonnaise, chives, garlic, vinegar, olive oil, and salt in the bowl of a food processor. Add a few grinds of black pepper. Whirl until smooth. If you don’t have a food processor, finely mince the garlic and whisk all of the ingredients in a medium bowl until smooth. Yum! The dressing looks delish!!! Thank you Thank you Thank you!! Hubby and I eat tons of raw veggies and salads. Our downfall is ranch dressing. We love it. Can't wait to try this recipe, I have some garlic chives growing right outside. I have always avoided dressing because of all they typically contain artificial flavors...So this looks great. Looking forward to giving this a try. It sounds interesting and very healthy too. Thanks for sharing. This looks delicious -- Can you just specify how long it'll keep? Thanks so much! This looks great! If you are short on time or ingredients, greek yogurt mixed with 1 package of ranch dressing dry mix is an easy dressing, too. When I have that desire for a creamy dressing I have a Tzatziki sauce recipe I like to make and use as a salad dressing. Gives me that creamy dressing satisfaction. I will have to give this a try too! How long will it stay good in the fridge typically? Stephanie G: Regarding storage, if well wrapped and stored in the fridge, it will keep for up to four days. Enjoy! You could also add a few T. Of liquid whey, then it will last a lot longer, like about 3 months! Its really easy to make, just buy some plain yogurt, put it in a strainer lined with either cheese cloth or a thin kitchen towel, put the strainer over a bowl, and let the whey drain out! This sounds great, another dressing I have kinda made up is 1 container of WW Key Lime yogurt and a 1/2 cup salsa(any kind). Delicious and only 2 WW PP. Love your recipies Snack Girl. That sounds like a great recipe. I can't wait to try it! Great post! Yum! This sounds like a great lightened up version! A while ago I saw an easy mock ranch recipe on Pinterest: take a pack of dry ranch dressing mix and put it in a food processor with cottage cheese. I made it to dip baked zucchini chips, and it was delicious that night. You could've fooled someone into thinking it was real ranch dressing! But when I packed up the rest in the fridge, it was sort of grainy the next day. Maybe I didn't process it long enough? Anyway, just a thought. Because of results of blood test my dr. said I had a terrible diet. Now thanks to Snack Girl I have been able to make some changes in what I eat without giving up taste.Thank you Snack Girl! I love ranch dressing but try to stay away from it for the obvious reason. Cannot WAIT to try this new lighter version! Thanks for the info! I still don't agree with using reduced-fat, low-fat, or fat-free products - ever. They are processed foods, and the fat is needed to carry nutrients all over your body. FAT DOESN'T MAKE YOU FAT. I've been making my own ranch for a while now.. tastes so much better. just a few changes... I just do equal parts mayo and ff yogurt, lemon juice, crushed garlic, tapitio, dried dill and parsley and a smidge of milk, buttermilk if I have on hand, to thin and salt. Saw the grilled romaine hearts on Food Network Star this weekend! It made me think of you!